Smith’s is excited to collaborate with MINIB, one of the leading manufacturers of fan convectors and trench heating in the Czech Republic. 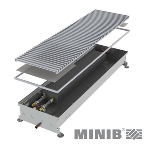 Since 1999, MINIB has invested considerably in the design and development of their products to ensure that they can offer technically and aesthetically mature solutions to their customers. The company’s growth and success to date is echoed by the fact that they currently distribute to thirty countries in Europe, Asia, Australia and America.